The 32mm and 36mm are approx 2 inches (50mm) long and the larger sizes are approx 4 inches (100mm) long. They are are threaded on each end enabling them to be stacked, creating a longer shade if required. Please note: the sizes refer to Hawke scopes, not the overall or thread diameters. 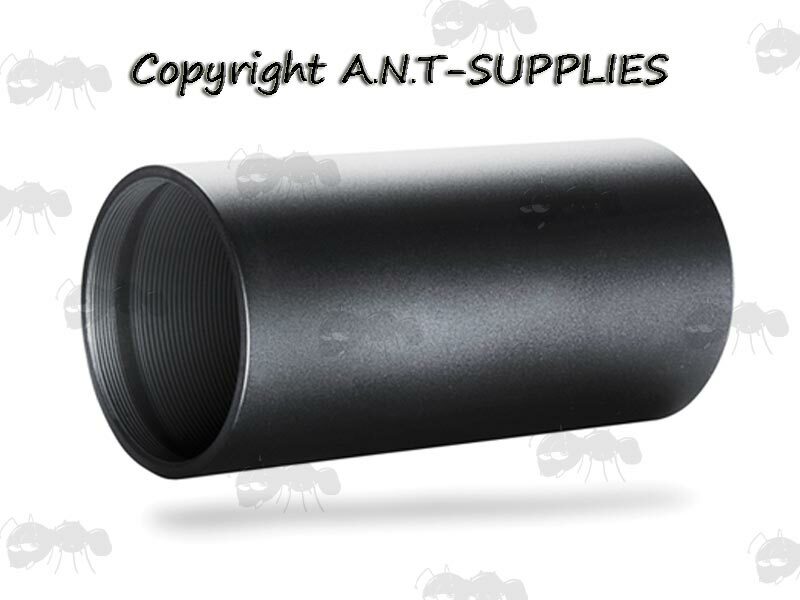 Thread adaptors are available for PRE-2015 Sidewinder scopes. Link to Hawke Scope Thread Adaptors page. Also available generic scope sunshades. 14 110 Vantage 2-7×32 1" 30/30 Duplex. 14 100 Vantage 4×32 1" 30/30 Duplex. 14 101 Vantage 4×32 1" Mil Dot. 13 100 Airmax 2-7×32 1" AMX. 14 111 Vantage 2-7×32 AO 1" Mil Dot. 14 211 Vantage 2-7×32 AO 1" Mil Dot. 14 102 Vantage 4×32 AO 1" Mil Dot. 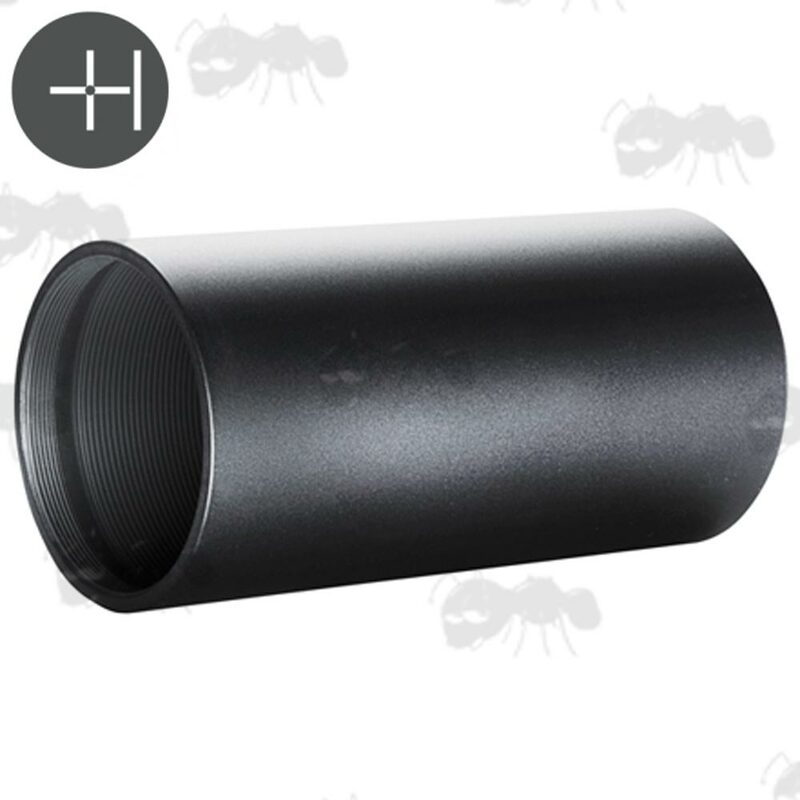 13 200 Airmax 30 SF Compact 3-12×40 30mm AMX IR. 14 220 Vantage 3-9×40 1" 30/30 Centre Cross. 14 120 Vantage 3-9×40 1" 30/30 Duplex. 14 121 Vantage 3-9×40 1" Mil Dot. 14 221 Vantage 3-9×40 1" Mil Dot. 14 224 Vantage 3-9×40 1" Rimfire .17 Mk2. 14 222 Vantage 3-9×40 1" Rimfire .22 (High Velocity). 14 223 Vantage 3-9×40 1" Rimfire .22 (Subsonic). 13 110 Airmax 3-9×40 1" AMX. 13 130 Airmax 4-12×40 1" AMX. 15 111 Panorama 3-9×40 AO 1" 10× ½ Mil Dot. 15 121 Panorama 4-12×40 AO 1" 10× ½ Mil Dot. 14 122 Vantage 3-9×40 AO 1" 30/30 Duplex. 14 123 Vantage 3-9×40 AO 1" Mil Dot. 14 225 Vantage 3-9×40 AO 1" Mil Dot. 14 140 Vantage 4-12×40 AO 1" 30/30 Duplex. 14 141 Vantage 4-12×40 AO 1" Mil Dot. 14 241 Vantage 4-12×40 AO 1" Rimfire .17 HMR. 14 242 Vantage 4-12×40 AO 1" Rimfire .22 WMR. 17 110 Sidewinder 6.5-20×42 30mm 20× ½ Mil Dot. 17 120 Sidewinder 8.5-25×42 30mm 20× ½ Mil Dot. 13 210 Airmax 30 SF Compact 4-16×44 30mm AMX IR. 16 310 Endurance 30 WA 1.5-6×44 30mm L4A Dot. 18 120 Frontier SF 3-15×44 1″ Mil Pro. 18 130 Frontier SF 4-20×44 1″ Mil Pro. 14 276 Vantage 30 WA 1.5-6×44 30mm L4A Dot. 14 160 Vantage SF 3-12×44 1" ½ Mil Dot. 14 161 Vantage SF 4-16×44 1" ½ Mil Dot. 14 162 Vantage SF 6-24×44 1" ½ Mil Dot. 13 300 Airmax 30 SF 3-12×50 30mm AMX IR. 13 310 Airmax 30 SF 4-16×50 30mm AMX IR. 13 320 Airmax 30 SF 6-24×50 30mm AMX IR. 13 340 Airmax 30 SF 8-32×50 30mm AMX IR. 13 220 Airmax 30 SF Compact 6-24×50 30mm AMX IR. 16 320 Endurance 30 WA 2.5-10×50 30mm LR Dot (8×). 16 321 Endurance 30 WA 2.5-10×50 30mm LRC (10×). 16 351 Endurance 30 WA SF 4-16×50 30mm 223/308 (16×). 16 350 Endurance 30 WA SF 4-16×50 30mm LR Dot (8×). 16 352 Endurance 30 WA SF 4-16×50 30mm LRC (16×). 16 361 Endurance 30 WA SF 6-24×50 30mm 223/308 (24×). 16 360 Endurance 30 WA SF 6-24×50 30mm LR Dot (16×). 16 362 Endurance 30 WA SF 6-24×50 30mm LRC (24×). 18 220 Frontier 30 SF 2.5-15×50 30mm LR Dot. 18 420 Frontier 30 SF 2.5-15×50 30mm LR Dot. 18 421 Frontier 30 SF 2.5-15×50 30mm Mil Pro. 18 222 Frontier 30 SF 2.5-15×50 30mm TMX. 18 430 Frontier 30 SF 4-24×50 30mm LR Dot. 18 431 Frontier 30 SF 4-24×50 30mm Mil Pro. 18 230 Frontier 30 SF 5-30×50 30mm LR Dot (16×). 18 232 Frontier 30 SF 5-30×50 30mm TMX. 18 320 Frontier FFP 3-15×50 30mm FFP Mil Ext. 18 520 Frontier FFP 3-15×50 30mm FFP Mil Pro. 18 530 Frontier FFP 4-20×50 30mm FFP Mil Pro. 18 140 Frontier SF 5-25×50 1″ Mil Pro. 17 210 Sidewinder 4-16×50 30mm 10× ½ Mil Dot. 17 211 Sidewinder 4-16×50 30mm SR Pro. 17 410 Sidewinder FFP 4-16×50 30mm FFP Mil. 14 130 Vantage 3-9×50 1" 30/30 Duplex. 14 131 Vantage 3-9×50 1" Mil Dot. 14 230 Vantage 3-9×50 1" Mil Dot. 14 231 Vantage 3-9×50 1" Rimfire .22 (Subsonic). 14 274 Vantage 30 WA 2.5-10×50 30mm L4A Dot. 14 296 Vantage 30 WA SF 4-16×50 30mm 1⁄2 Mil Dot. 14 297 Vantage 30 WA SF 6-24×50 30mm 1⁄2 Mil Dot. 14 254 Vantage 4-12×50 1" L4A Dot. 14 250 Vantage 4-12×50 1" Mil Dot. 14 251 Vantage 4-12×50 1" Rimfire .22 (Subsonic). 14 290 Vantage SF 3-12×50 1" ½ Mil Dot. 14 291 Vantage SF 4-16×50 1" 1⁄2 Mil Dot. 14 292 Vantage SF 6-24×50 1" ½ Mil Dot. 13 140 Airmax 4-12×50 1" AMX. 15 131 Panorama 4-12×50 AO 1" 10× ½ Mil Dot. 15 140 Panorama 5-15×50 AO 1" 10× ½ Mil Dot. 15 150 Panorama 6-18×50 AO 1" 10× ½ Mil Dot. 14 133 Vantage 3-9×50 AO 1" Mil Dot. 14 232 Vantage 3-9×50 AO 1" Mil Dot. 14 252 Vantage 4-12×50 AO 1" Mil Dot. 14 260 Vantage 4-16×50 AO 1" Mil Dot. 14 261 Vantage 4-16×50 AO 1" Rimfire .17 HMR. 14 265 Vantage 6-24×50 AO 1" Mil Dot. 16 330 Endurance 30 WA 3-12×56 30mm LR Dot (8×). 16 331 Endurance 30 WA 3-12×56 30mm LRC (12×). 18 440 Frontier 30 SF 5-30×56 30mm LR Dot. 18 441 Frontier 30 SF 5-30×56 30mm Mil Pro. 18 330 Frontier FFP 5-25×56 30mm FFP Mil Ext. 18 540 Frontier FFP 5-25×56 30mm FFP Mil Pro. 17 220 Sidewinder 6-24×56 30mm 20× ½ Mil Dot. 17 221 Sidewinder 6-24×56 30mm SR Pro. 17 230 Sidewinder 8-32×56 30mm 20× ½ Mil Dot. 17 231 Sidewinder 8-32×56 30mm SR Pro. 17 360 Sidewinder ED 8-40x56 30mm TMX. 17 420 Sidewinder FFP 6-24×56 30mm FFP Mil. 14 275 Vantage 30 WA 3-12×56 30mm L4A Dot. 17 370 Sidewinder ED 10-50×60 30mm TMX.